May be dual SIM phones are too boring to make these days, that’s why LG announces and even releases a triple SIM smartphone in the market quite silently. The Android powered triple SIM handset comes with 3-inch display with 240 x 320 pixels and runs on Android 4.1 Jelly Bean. It has a dedicated key to switch between the SIMs. Last year the second best South Korean smartphone maker launched its Optimus L1 II E470 which can probably be called as the predecessor of the latest triple SIM supporting device. The LG Optimus L1 II E475 is powered by an unspecified 1GHz processor clubbed with 512MB RAM. It packs 4GB of internal memory, MicroSD card slot, and 1540 mAh battery. It sports 2-megapixel rear camera with 4x zooming capability. On the connectivity front LG Optimus L1 II Tri include Bluetooth 3.0,Wi-Fi, 3G, GPRS,WAP and EDGE. The device measures 102.6 x 58.9 x 13.3mm and weighs 104.6 grams. The device has been listed on the company website, without the pricing. it is speculated to carry a price tag of $127 (approximately Rs. 7,000). 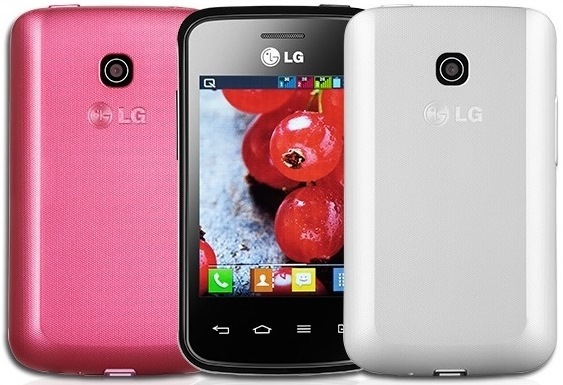 The LG Optimus L1 2 Tri comes in Black, White and Pink color variants. As of now there is no word on the launch of the device in India it is expected to be released first in Brazil.